Delivered to U.S. Army Air Force as 44-72202, 19??. Delivered to Royal Swedish AF as Fv26112, June 13, 1947. Delivered to FA Dominicana as FAD 1917, December 1952-1984. Brian O'Farrell/Johnson Aviation, Miami, FL, May 19, 1984-1987. SAAF Historic Flight, Lanseria AB, South Africa, 1987-1993. - Arrived at Cape Town, November 14, 1987. - Restoration to airworthy started. SAAF Museum, Swartkop AB, South Africa, 1993-2010. - Restored to airworthy, 1995-1998. - First flight, October 13, 1998. 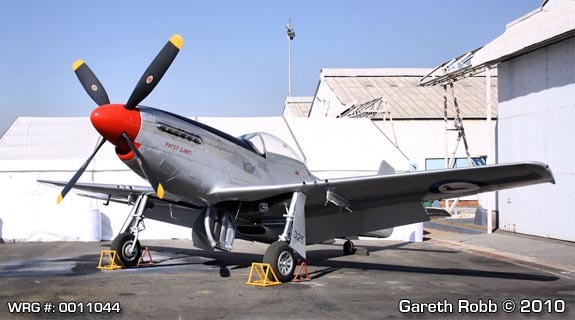 -- Flew as SAAF "325". - Forced to make landing with one main gear retracted, Waterkloof AB, May 6, 2001. -- Recieved damage to the starboard wing and propeller, the later also damaging the engine. -- Flown by Lt. Col. Neil Thomas. - Under repair back to airworthy status, Zwartkops AFB, 2001-2010. - Painted in Korean War era scheme as SAAF/325/Patsy Dawn.